BMW turned 100 this year, and to celebrate, the company has cooked up some concept cars from the stable of all the brands it owns, many of which are not actually named “BMW.” We’ve already seen the BMW Vision Next 100 Concept, but now there’s a Mini concept, and it makes the future of car-sharing seem awesome. BMW realizes that car-sharing is going to become increasingly prominent, particularly in large cities. And, seeing as the company considers its Mini as the “perfect premium compact car for the modern city,” it’s going to want to keep up with the times. But for all of its futile hopes and dreams, that’s why BMW has introduced the Mini Vision Next 100 Concept, a car that BMW thinks embodies the future of inter-city mobility. Okay, so what is this odd looking city car? 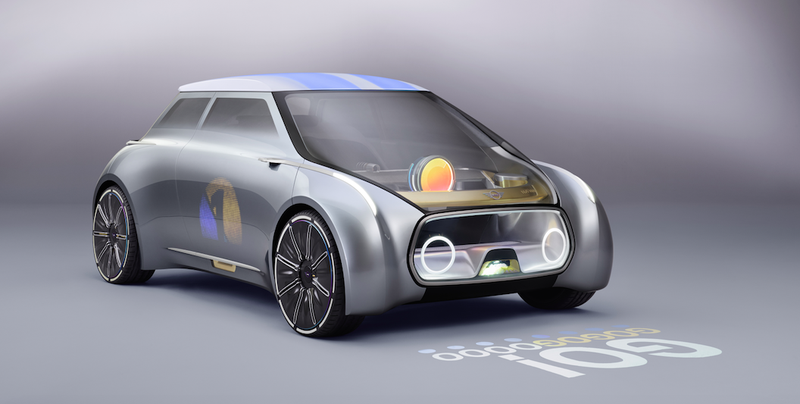 Well, the Mini Next 100 Concept is basically a “shared” car that adapts to individual users, and offers either autonomous mode or full-on driver-focused mode. Which is all very brave of BMW, since sharing a car means fewer car owners, which means fewer cars being sold, which means less money for BMW, which is a for-profit corporation. The MINI of the future will be available 24/7, able to pick its driver up from their desired location in a fully automated way and will adapt itself to the driver’s individual tastes, interests and preferences. That all sounds futuristic, though we humans living in the present also have a few radio preset buttons. On the outside, the car gets a “discreet, silver skin” that can change its colors and graphics based on the rider’s taste. The interior also changes based on who decides to take a seat, making the experience seem a lot more personal than today’s public transportation modes. Another idea behind the concept car—one with a very quirky name—is what the company calls a “Cooperizer,” which is basically a kaleidoscope-like circular instrument that acts as the car’s user interface. ...the car can be adapted to give a perfectly personalised driving experience, whether driven conventionally or autonomously. The “Cooperizer,” also gets a dorky “Inspire Me” button, which “checks downloaded user data to select information of interest to the driver and provide them with potential sources of inspiration,” like a good song or a nice driving road. But aside from some of those quirky features, BMW insists that Minis of the future will retain their driver-focused attitudes. BMW says the Vision Next 100 can either be driven with pedals and a steering wheel, or the controls can simply slide away, giving the passenger more space. BMW says the interior layout, along with augmented reality displays, which can “show the route or ideal driving line,” which is useful for hitting apexes. So, BMW thinks the future will offer a small, lightweight, adaptable shared car with a great view of the road, and the option to drive or be driven autonomously. Even if this is just a thought exercise, this does sound promising.